Civilian Public Service camp 141, Gulfport, Mississippi. 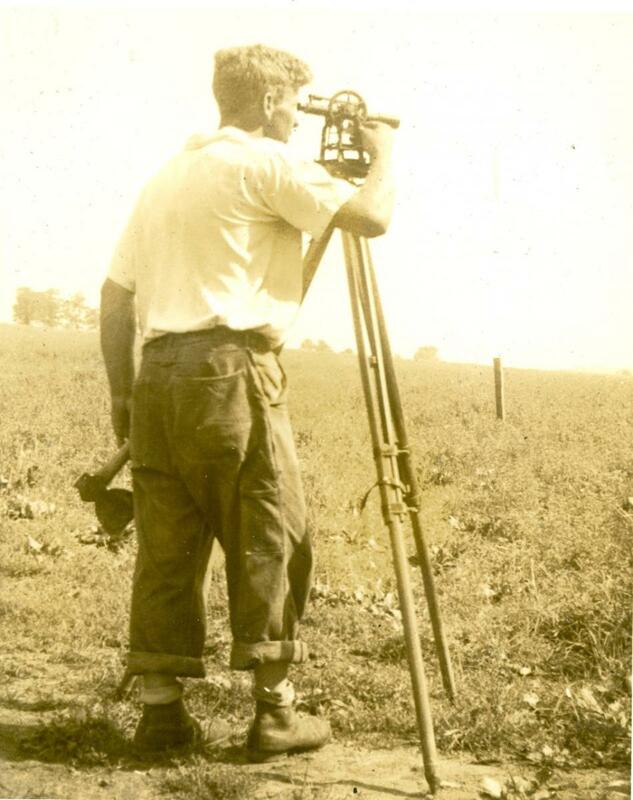 Surveying for terraces and ditches. Civilian Public Service camp 141, Gulfport, Mississippi. Digging the privy pit on installation. Making the contact on the typhus control program. 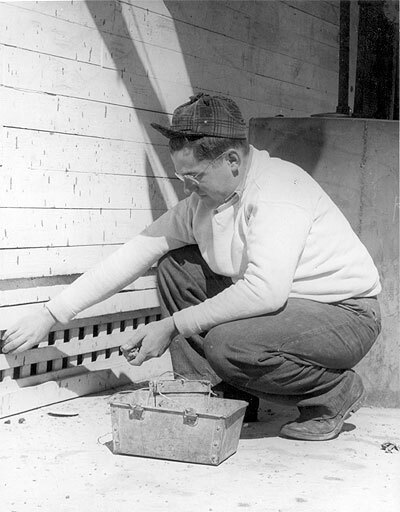 Harry Lantz distributes rat poison for typhus control. From the private collection of Leo Harder, licensed under Creative Commons Attribution Share-Alike 2.5. CPS Unit No. 141, a Public Health Service unit located at Harrison County Health Department in Gulfport, Mississippi and operated by Mennonite Central Committee, opened in February 1945. The men worked in hookworm control and education, conducted health surveys and testing as well as built, sold and installed privies. At the conclusion of the CPS program, Mennonite Central Committee continued a Voluntary Service unit in the community. Gulfport, Mississippi, an important southern terminus of the Gulf and Ship Island Railroad, was a relatively prosperous industrial and shipping center. The CPS unit was located four and one-half miles north and one-quarter mile east of Gulfport in a camp previously used for relocation of transients, then operated by the Girl Scouts. Just outside the city limits between the camp and Gulfport rested North Gulfport, an unincorporated community with unpaved streets, lack of a water or sewage system, run-down houses in contrast with conditions in Gulfport. North Gulfport was essentially an all black community whereas Gulfport was white, except for several pockets of blacks. Jobs, restricted along racial lines, contributed to poverty in North Gulfport and in the surrounding rural areas. The Camp Bernard CPS unit would serve both poor whites and poor blacks. Claude Shotts, of the NSBRO Special Projects Section, had traveled through Alabama, Mississippi and Georgia to investigate possibilities for CPS units that would work to control environmental diseases. Since the Mississippi State Board of Health had been interested in establishing a CPS Public Health unit in the state, they approached the governor. Serious sanitation problems in Harrison County accompanied by high incidence of hookworm disease contributed to its designation as an area of greatest need. Harrison County officials expressed their interest, and Shotts worked with leaders to plan a public meeting to discuss the potential for locating a unit there, since conscientious objection was not a popular idea in the South. Because the Florida public health units had run into public opposition, NSBRO wanted to carefully check out a site and plan for the introduction of a CPS unit. Representatives of the Chamber of Commerce, the American Legion, the public schools, the mayors of Gulfport and Biloxi, representatives of the state and county health departments, as well as the United States Public Health Service and the press, all gathered on August 24, 1944. After full discussion, they unanimously agreed in principle to establish a project in Harrison County. The following month, the Board of Supervisors contacted the local trade union council to seek approval, which was granted. On September 15, 1944, the Harrison County Board of Supervisors officially requested a CPS unit for Harrison County. The State Board of Health concurred and requested that Selective Service authorize such a unit. Shotts had learned that public officials “spoke highly of the Mennonites who live in Southern Mississippi,” and inferred that public relations should be good. He had already discussed possibilities with Orie O. Miller, Executive Secretary of Mennonite Central Committee (MCC), who agreed to send a representative to Harrison County as soon as Selective Service approved a unit. In preparation for the unit arrival, crews made improvements to the camp—installing screens for windows and doors, patching roofs, repairing steps and doors, installing lockers, clearing trash from the grounds, opening sewer lines, and removing debris from the bottom of the pond. Camp Bernard, named for a nearby bayou, was surrounded by tall pines. An artesian well over 600 feet deep on the grounds furnished drinking water. The unit was approved for forty men. In the first phase, MCC selected nineteen men from one hundred and eight applications for transfer from other CPS camps and units. One of the applications described the complex motivation of those who, near the end of the war, applied for transfer to Gulfport. Over the life of the camp, nearly seventy men served. They entered CPS from sixteen different states. Some of the men were married, some with families who followed them to the camp. The overwhelming majority identified eleven different Mennonite group affiliations when entering CPS (Amish Mennonite, Brethren in Christ, Conservative Amish Mennonite, Church of God in Christ Mennonite, General Conference, Independent Mennonite, Krimmer Mennonite Brethren, Mennonite Brethren, Mennonite Church, Old Order Amish and Old Order Mennonite). Two men reported Methodist affiliation and one Christadelphian. During the summer of 1946, eight women joined a voluntary service unit based at Camp Bernard and worked in the community. They not only taught Bible school in both the black and white communities, but also conducted supervised play at designated hours on playgrounds in the Jim Crow South. Others joined later in the summer and continued on into the fall, remaining longer than the summer unit women. A second women’s summer unit came for the summer of 1947. The project, designed to improve health conditions in Harrison County, also provided an opportunity for men to engage in relief work in the community. As such the unit was described as “relief work at home”, as compared to foreign relief training for work abroad. High standards crafted for admission stressed the same standards stated for foreign relief training units. As word of the new Gulfport unit spread throughout existing locations, controversy arose, especially in some of the camps administered by the American Friends Service Committee and the Brethren Service Committee. In particular, CPS assignees wanted to know if the new unit would be “freely interracial or Jim Crow”. The camp opened in February 1945. As a first project, the men installed sanitary facilities at a Boy Scout camp near Biloxi, since it was without water or sewage systems and the toilets were inadequate. Heavily utilized, Wilkes Camp affected the health of many. On CPS assignee at Gulfport offered an educational program in the community, showing health films to Boy Scout groups and other organizations throughout the county. Some of the men created materials for hookworm education. One drafted maps to identify areas with unsanitary conditions. A team devoted primary effort to the construction and installation of sanitary privies. Men prefabricated the privy bases of cypress for durability, a concrete slab with riser, made the walls and seat of pine, and topped the unit with a corrugated roof. The men hauled the units to the site by truck, where they dug the hole and affixed the parts to erect the privy. 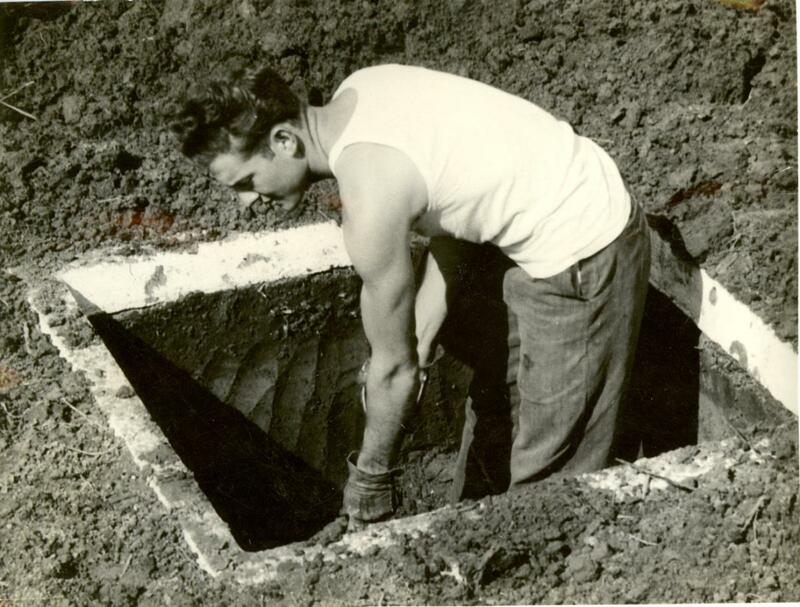 The first privy was installed on June 14, 1944. By March 21, 1946, the men had installed 319 privies and visited 1,442 homes. Privies cost $30, which covered the materials only, since CPS men were not paid for their labor. Any receipts over expenses were returned to the revolving health fund for direct health programs of Harrison County Public Health. The CPS men worked with the County Health Department on several special projects, including a rat-poisoning campaign to control typhus, spending 349 person days on this effort. The laboratory also conducted tests in milk sanitation. Every other Saturday night, young and old from the community gathered at Camp Bernard for an evening of games, educational films and refreshments. The men also engaged members of the community in toy repair and building projects. The men held church services at the camp. A number attended Gulfhaven Mennonite Church and participated in its program. Once a month, the church and the camp held conjoint services either at the camp or the church. One of the CPS men was ordained to the ministry in the Gulfhaven Church and settled permanently in the community. Others attended the Methodist church. Men also helped at other Mennonite churches in Des Allemands and Akers, Louisiana. In their after work hours, CPSers took on projects to improve the North Gulfport black school. They refitted windows, replaced broken panes, built-in a new cupboard in the kitchen, stopped chimney leaks, and painted the ceiling. The men and women also showed educational films on health and other subjects at the schools, erected playground equipment, and promoted shop classes for boys of the North Gulfport area. In many contacts with families, the men found opportunities to witness as noted below. But the two men kindly refused as they were not in the habit of receiving tips. At some point during the life of the camp, a number of men assisted an Amish community with a barn raising. Emmanuel C. Hertzler, who served as laboratory director for the Harrison County Board of Health Laboratories and also coordinated the laboratory studies of the CPS project, reflected on his experience nearly sixty years later. My experience in studying parasites during my university days had prepared me for microscopic identifications, but nothing had prepared me for the devastating effect that these organisms had on people. I had some fears of going to the South because I supposed I would be working for and with antagonistic militarists. Imagine my surprise to see that our CPS project and we, the CPS workers, were warmly welcomed. When the State Director of Public Health learned that I would be opening the Gulfport laboratory without a good microscope he took me to his stock of new instruments in the State Capitol building. He told me to take my pick and so I obtained two brand new, extraordinarily good microscopes for our new laboratory in Gulfport. The men at Gulfport published Christian Service in the South beginning with the Summer 1945 issue. Near the end of the unit, as the war had drawn to a close and a number of the original group of men had been discharged, the average age dropped as did the level of educational attainment. In addition, the decline in morale at the end of the war was found at Gulfport as well as at other units. When MCC began the camp at a time the war was nearing the end in Europe, they considered that Gulfport might be a site for continued service to the community and society in partnership with churches. 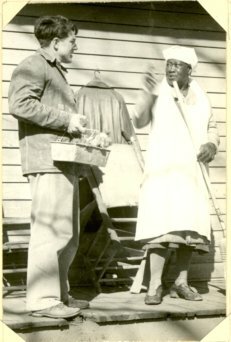 The VS Summer Service units tested the model of serving poor blacks and whites in the South. By February 15, 1947, MCC acted to recognize the Gulfport Unit as an official Voluntary Service Unit that would continue after the close of CPS into the 1960s. In this way, the Gulfport unit served as an early model for other Mennonite voluntary service units that opened in both rural and urban areas in the two decades following the Second World War. For more information on the work, life and programs in Mennonite public health camps, see Melvin Gingerich, Service for Peace: A History of Mennonite Civilian Public Service. Akron, PA: Mennonite Central Committee printed by Herald Press, Scottdale, PA 1949, Chapter XII 252-275. For more information on the Gulfport CPS unit and its continuation as a voluntary service unit after the war, see David A. Haury, The Quiet Demonstration: The Mennonite Mission in Gulfport, Mississippi. Newton KS: Faith and Life Press, 1979.